Yesterday Chez Panisse celebrated it’s 42nd birthday. I have always felt a sense of kinship with the restaurant, as I too was born in 1971. 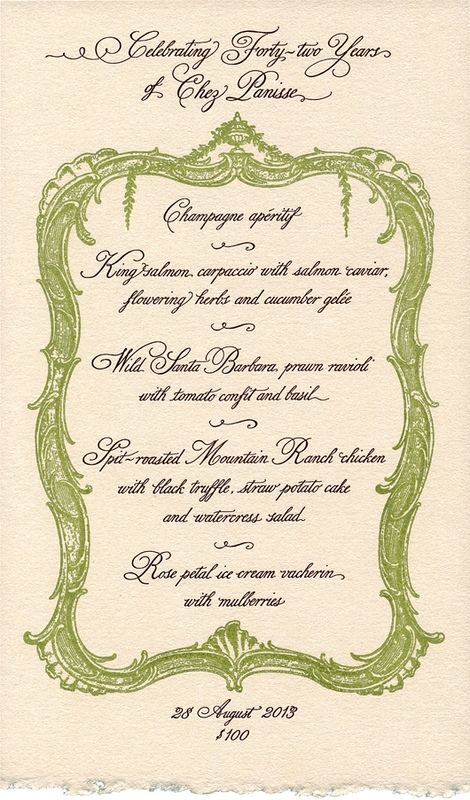 I was so pleased when I was contacted to design and print the menus for this celebratory occasion. I kept my design simple and elegant using a decorative border from the late 1700′s which I silkscreen printed in a soft moss green. I hand-calligraphed the menu wording in a graceful and delicate style and letterpress printed onto a plush fawn colored paper. When I delivered the menus in the afternoon I got to walk through the downstairs kitchen full of all the delicious sights and aromas of the feast to come. Happy birthday Chez Panisse, I look forward to growing old together.